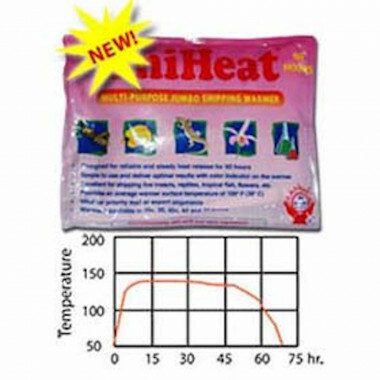 Uniheat shipping warmers are heat packs especially designed over a decade ago for shipping tropical fish, reptiles, insects, live food, corals, flowers, plants, seedlings, and other temperature sensitive items. Uniheat air activated Uniheat 60 hour Jumbo shipping warmer designed for the safe transportation of tropical fish, corals, reptiles, amphibians, insects, live foods, flowers and plants.Disposable, biodegradable and environmentally friendly warmer.Shipping Warmer Contents - Iron Powder, water, activated carbon, vermiculite, wood powder and salt. 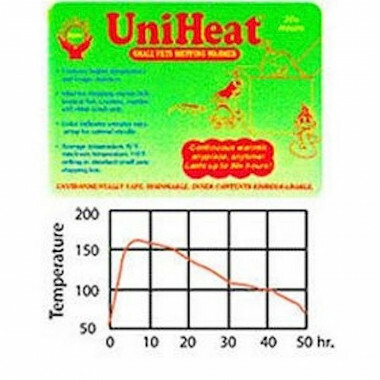 Uniheat 30 hour shipping warmer designed for the safe transportation of tropical fish, corals, reptiles, amphibians, insects, live foods, flowers and plants. Disposable, biodegradable and environmentally friendly warmer. Uniheat Shipping Warmer Contents - Iron Powder, water, activated carbon, vermiculite, wood powder and salt.